smooth hairy surface. A cratered surface means too much heat. 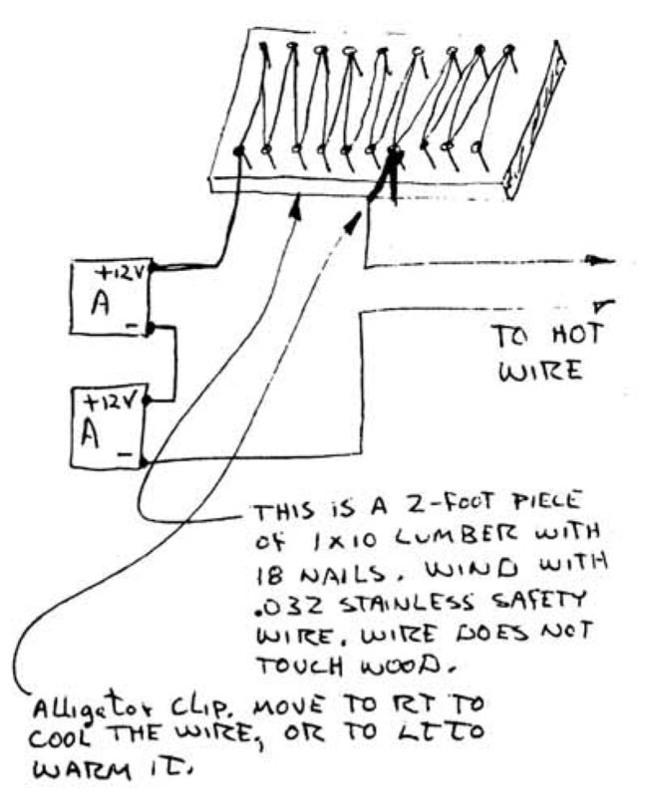 If the wire is too cold, the cutter will have to be forced hard, causing the wire to lag. Lag should not exceed 1/2 inch over the top and bottom of the wing and not over 1/8 inch around the leading edge. If the wire is too hot, it will burn away too much foam, making the part too small and will result in ruts in the foam if the wire is inadvertently stopped during cutting. 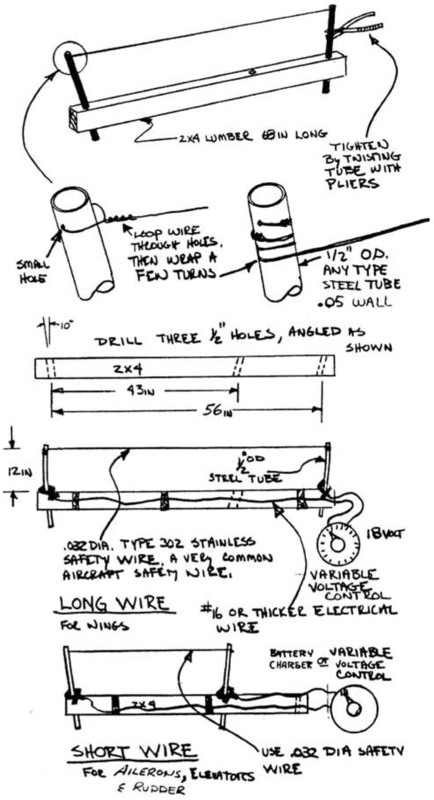 The wire should be tightened until the wire starts to yield. Check this by tightening the wire while plunking it listening to the sound. The pitch will increase until the wire yields. You will need a table to jig and build the wings and canard, It should he at least 2ft by 10 ft. Any larger than 4 ft by 12 ft will just get in the way. Use a little care in making a flat, untwisted surface. The following is s sketch of the one we made and it works fine. The box design makes it stiff in torsion. Set it up with the top 35 to 39 inches above the floor. Don’t get carried away with surface finish, since you are going to be gluing blocks to it with Bondo and chiseling them off several times. The materials, processes, and terminology used in the construction of your Quickie are new to homebuilding. This section is devoted to familiarizing you with the language, materials, and techniques used in these plans. This information is basic to the construction of your airplane. You should study this section and be sure that you underetand all of it before continuing. There are five basic materials you will be working with. fiberglass cloth, epoxy, microspheres, flox, and foam. Each material, its properties, and uses will be discussed in detail. Basic processes using these materials will also be discussed. The most basic structural material in your Quickie is glass cloth. Glass cloth is available commercially in hundreds of different weights, weaves, strengths, and working properties. The use of glass in aircraft structures, particularly structural sandwich composites, is a recent development. Very few of the commercially available glass cloth types are compatible with aircraft requirements for high strength and light weight. Even fewer are suitable for the handlayup techniques developed by RAF for the homebuilder. The glass cloth used in the VariEze has been specifically selected for the optimum combination of workability, strength, and weight. The glass cloth in your VariEze carries primary loads, and its correct application is of vital importance. Even though doing your glass work correctly is important, this doesn’t mean that it is difficult; in fact it’s VariEze! Two types of glass cloth are used, a bi-directional cloth (RA5277BID). and a unidirectional cloth (RA5177UND). 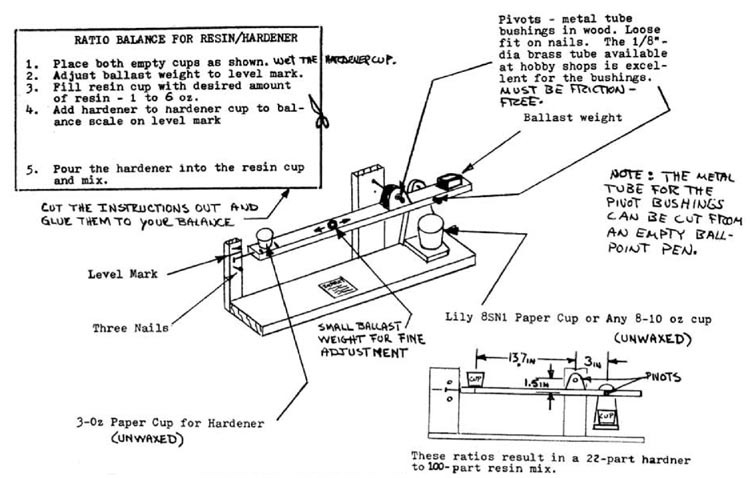 (Use the full part number for ordering your cloth, but for simplicity the plans will use only the BID or UNI designations.) 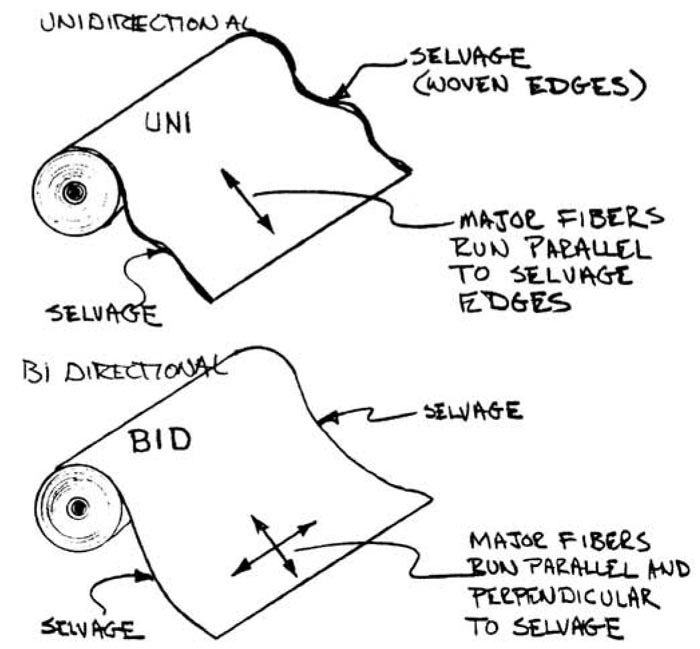 BID cloth has half of the fibers woven parallel to the selvage edge of the cloth and the other half at right angles to the selvage, giving the cloth the sane strength in both directions. 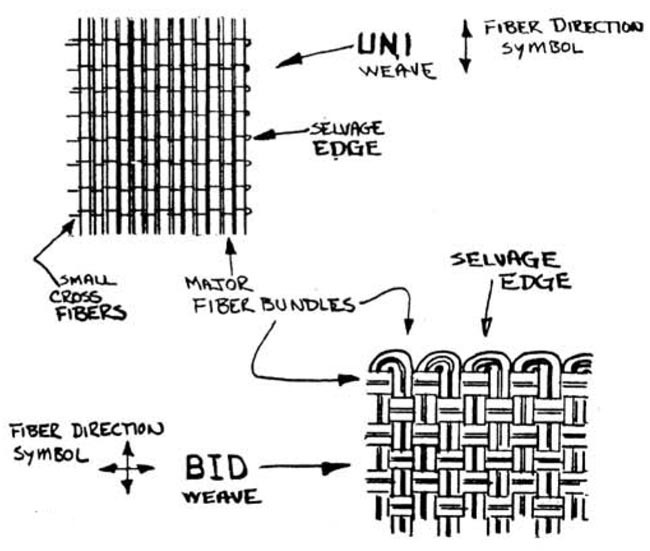 The selvage is the woven edge of a bolt of fabric as shown in the accompanying sketch.